I have reviewed Red Hurley’s live shows many times in recent years, spanning his gradual rise back to the top of Irish Showbusiness and his new found significant international success in the United States & UK. It seems everyone is praising the singer of late from leading Irish media figures such as Kevin Myers & Ryan Turbridy to American luminaries such as Oprah Winfrey and her own mentor Maya Angelou. Yet it wasn’t always this way. Not so long ago Red's once glittering career had gradually ebbed away and his live appearances and recordings were few and far between. During the 1990s in particular, he seemed almost invisible spending most of his time in the USA. Gradually in the 21rst century all that began to change. Just as he had done in the 1970s & 80s it was through well produced recordings that Red Hurley slowly rebuilt his career. Unlike his contemporaries of the showband era, Red always placed a premium on well produced records often working with the very best international producers and writers at a time when others were content to churn out covers and poorly recorded material. It was this professionalism in the end which enabled him to make what must surely be one of the most spectacular comebacks in Irish Showbusiness history. During the past 5-6 years he has recorded almost half a dozen successful albums, appeared regularly on top TV shows including his own US TV special (Recorded live in Ireland) and mounted at least 2 concert tours a year, selling out shows at Dublin’s Grand Canal Theatre and other nationwide venues despite the recession. It seems Ireland has fallen in love with Red Hurley all over again. There are few who can possibly envy Red his return to the top. Well liked by his peers and admired by musicians and composers alike for his wide musical repertoire and sheer vocal power, the man is literally riding the crest of a wave at present. Despite this he is never complacent and always striving to innovate and even educate his own audience on differing musical styles. His Olympia Theatre summer show on July 2nd (part of a small Irish summer tour) showcased once again not just his still stunning voice but his varied musical influences. The concert naturally featured his crowd pleasing greatest hits but also material as diverse as Jerome Kern’s ‘The way you look tonight’ and Paul Anka’s Sinatra classic ‘My Way’ which he sang with moving pathos and deliberate restraint. Never derivative and always original he managed to avoid a Sinatra esque imitation finding new depths to the song and virtually making it his own. A songwriter’s dream, Red Hurley can find so much to say through his skilful and impeccably judged vocal performances breathing new life into classics and reenergising even his own back catalogue. Some of his biggest domestic hits ‘When & Love Is All’ have been brought into the modern era with fresh contemporary arrangements. He has even ventured into Gospel music similar to his idol Tom Jones. Both singers have recently recorded well received Gospel Albums aimed primarily at the US market but which have crossed the Atlantic and found an audience here and the UK. Red Hurley is due back in Dublin later in 2011 to play a Christmas Concert at the Helix which will no doubt once again be a sell out. 2011 has been a good year for him. 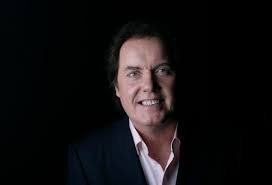 He has returned to the top of Irish Showbusiness with a high profile Late Late show appearance, sell out Irish and US tours and seen his talents recognised as never before by a wide variety of critics. Red Hurley is one of those rare singers who can actually sing ‘My Way’ with complete authenticity. Despite the setbacks and career ups and downs, he has endured and prospered with a voice which sounds better than ever and a stage presence that has not diminished. The man has indeed done it 'his way' remaining faithful to his own unique musical style but always open to change and innovation and indeed to pushing his own musical boundaries and those of his loyal fanbase. He is quite simply, a living legend. Would regard myself as a Red Hurley fan - and have travelled the length & breadth of the country over the years. By this comment you can assume I am a big fan of his and no doubt will make my way to get tickets for the Helix on 17 December. However after his recent concerts in the Draoicht Theatre and Olympia ( almost exactly the same programme) I would be hopeful of perhaps a change of content somewhere along the line for the Helix. A fine singer and a nice person - it is clear however he is being somewhat conservative in his singing and perhap's rightly saving the high notes which were once so natural and unstrained. While never feeling shortchanged with a Red Hurley performance the ' How Great thou Art' perhap's should be binned - as in abscence of the high 'money note' at the end it leaves it almost in limbo. Those of us who have trawled this country & others to see Red will never personally criticise his quality as a singer and entertainer - but he is not a operatic tenor and perhap's those ' How great thou Art & Deep River' attempts have taken more out of the voice than should have - and like all of us the sand's of time do not stop for singers. That said Red Hurley's voice even now is perhap's worth more than crooning ' My Way' and ' You were always on my mind' and hopefully he may give this some thought before his Helix performance in Dublin - as his loyal followers and supporters deserve his best attempt especially during such hard financial restraint - where it is not cheap to attend a concert. The positives however greatly outweigh the negatives with Red and he deserves all the credit for mantaining such quality in his performances - where the above could seem like a criticism. But he has set the bar very high over the years whether it be in Pubs, Clubs or Theatres.. Thank you for permitting this comment and hopefully will not be regarded as ' vile'.